The George Dannatt trust needed to relocate the collection of the artist George Dannatt to a new facility in Christchurch. The old collection was housed in many different rooms and they wanted to ensure that the new storage facility was an improvement on their previous location. After contacting Dexion, who are the main shelving supplier for Hampshire Mezzanine Floors, who cover the Hampshire, Dorset and Wiltshire areas for sale of Dexion products. Hampshire Mezzanine visited the site and proposed a number of shelving products to provide both bulk storage and a section of wall mounted storage to maximise the space available. As the clients had no goods-in facilities on site, all the materials were delivered to HMF’s premises in Southampton and then delivered by one of our installers’ and erected in one day. The main shelving was constructed using the Dexion longspan system with chipboard shelves including a chipboard base shelf. 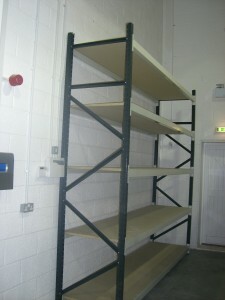 This shelving system is very easy to adjust if required in the future. The project was installed to the client’s satisfaction, on time and on budget. In 1986 George and Ann Dannatt established a Charitable Trust, whose seven trustees are responsible for the proper care, management and future of the paintings, constructions and works of art collected by and created by George Dannatt. The essential purpose of the Trust, as defined in the trust deed, is to advance public education in the visual arts.